These two cards were not available in a Collector Pack. 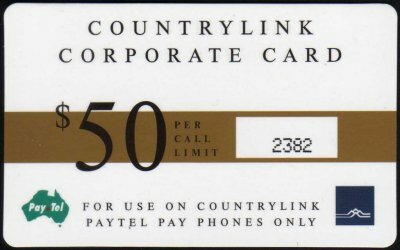 The cards were originally produced to enable Countrylink on-board staff to make calls through the PayTel payphones. The cards were numbered on the front and required a pin number to operate. The $15 was free to all members and the $50 free to those members who bought the complete "Railways Of Australia, Series 2". These cards are Railways Of Australia Series 2, free cards.